Bonn, Nov 12 – Global industry is set to deliver much of the emissions reductions needed to achieve the Paris Agreement goal but closer national and international policy and implementation strategy partnerships together with governments will help business take further, faster action. This was one of the key messages today from business leaders and high-level politicians at the special Industry Day event at the COP23 UN Climate Change Conference, where the 2017 Climate and Clean Air Awards are also being presented to governments, businesses and NGOs for efforts to reduce short-lived climate pollutants. “California strongly supports the United Nations’ unstoppable move to decarbonize the world economy. We join with states across America—and around the world—that will continue aggressive action to curb greenhouse gas emissions,” said Jerry Brown, Governor of California and a leader of climate policy in his home state. How to ensure a structured policy dialogue between governments and other stakeholders through the Marrakech Partnership for global Climate Action. How to formally introduce and incorporate input from non-state actors in the Facilitative Dialogue between governments on where we are, where we want to go and how we get there. The central goal of the Paris Agreement is to keep the average global temperature rise well below 2 degrees Celsius and as close as possible to 1.5 degrees. About one degree of that rise has already happened, underlining the urgency to progress further and faster to cut the greenhouse gases that cause global warming. Getting on track to that goal is required if the world is also to achieve the 17 Sustainable Development Goals under the UN 2030 Agenda, and faster action by global industry is a cross-cutting requirement for every one of these 17 goals. Since 2015, over 600 companies with combined revenues of more than USD$15 trillion have made over 1,000 commitments to climate action through We Mean Business. Many are going 100% renewable through RE100, implementing science-based climate targets and collaborating across sectors through the Low Carbon Technology Partnerships initiative (LCTPi). These ambitious companies are collectively driving the transition to the low-carbon world. Taken together, the ambitions of LCTPi alone are estimated to target 65% of emissions reductions necessary for remaining under the 2°C limit, and could channel USD $5-10 trillion of investment into the low-carbon economy while supporting millions of jobs worldwide. This is a just fraction of what industry can contribute to implementation of the Paris Agreement because there is significant untapped potential for what could be accomplished in the right policy environment. “Industry will deliver the low-carbon economy of the future. Forward-thinking companies must continue to push policy in the right direction,” said Nigel Topping, CEO of We Mean Business. To highlight the contributions of industry, the Climate and Clean Air Coalition is today recognizing the importance of industry actions to reduce climate pollutants, as well as government efforts to create the policies and regulations that enable these activities and inspire innovation. Manuel Pulgar-Vidal a jury member for the 2017 Climate and Clean Air Award, Head of Climate and Energy at WWF, and former Minister of Environment for Peru and President of COP20, said the winners represent what fast climate action looks like. As business and other non-state actors act together on climate like this, they serve as proof for policymakers that strong climate targets will be supported by the implementation of practical solutions. It’s clear that industry is leading the way to a low-carbon world and that companies are poised to work with governments. “We are key implementation partners for the Paris Agreement. The in-depth transformation requires all sectors of society to join forces. Business is willing to do its share to lead the way and to be instrumental in the delivery” said Jean-Pierre Clamadieu, Solvay CEO and WBCSD Vice-Chair. 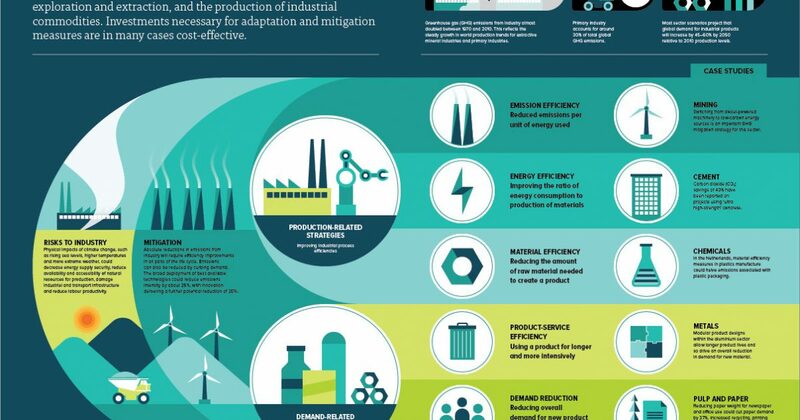 Business and industry are harnessing trends in the circular economy, low-carbon infrastructure and digital technology to deliver the climate solutions that will speed the transition to low-carbon economy. These topics are all central to discussions taking place during Industry Day. A circular economy is a system in which waste and emissions are minimized by actions such as repairing, reusing and recycling.